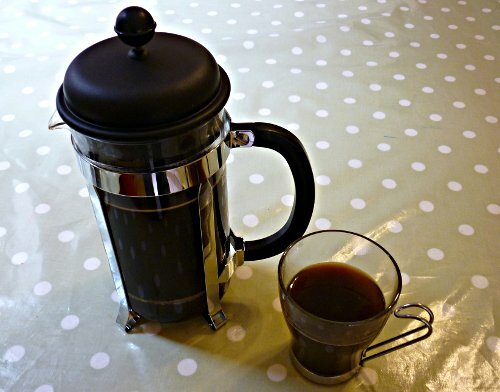 The following is a step by step guide to brewing a great French Press. 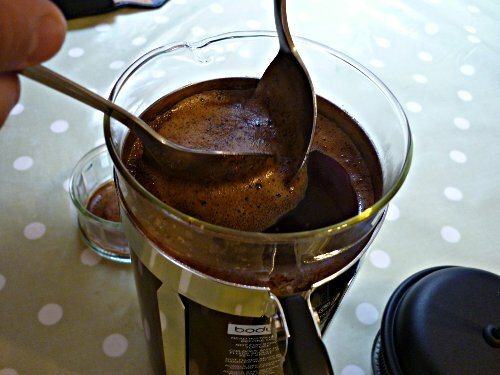 I should point out that my method is very much based on James Hoffman’s French Press video which itself borrowed Tim Wendelboe’s great idea to remove the floating foam after steeping. So full kudos to James and Tim for coming up with what I would say is pretty much the definitive technique. 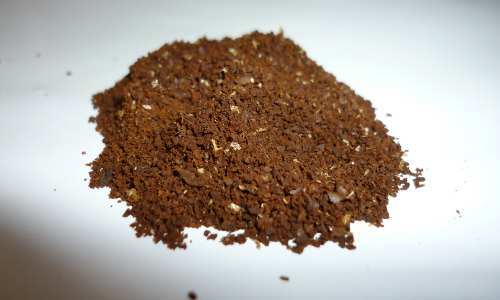 The coffee should be ground coarsly for french press. 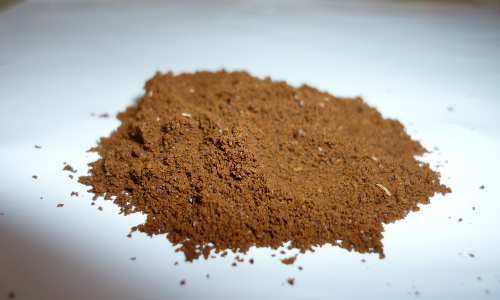 See the pictures below contrasting beans ground for espresso vs a much coarser grind for french press. Using hot water, pre-warm the press so as not to lose heat. 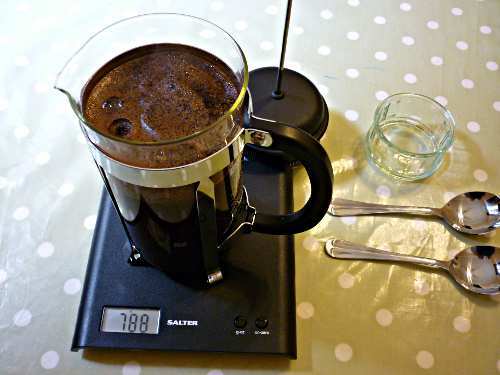 The coffee is weighed into the press so you know exactly how much you are using. 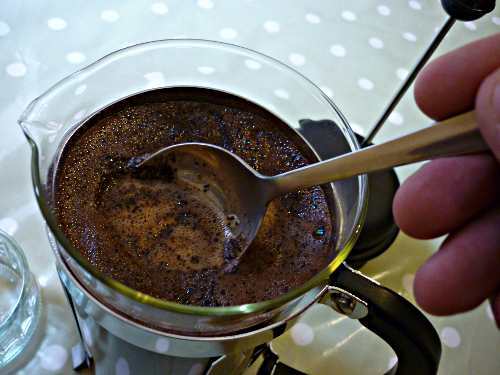 I tend to use about 50g in a standard 4-cup Bodum. Which fits about right with James Hoffman’s 65g/litre. The tip here is to weigh the water into the press. You can skip this part if you want, but the idea is that coffee blooms differently depending on how freshly ground it is. 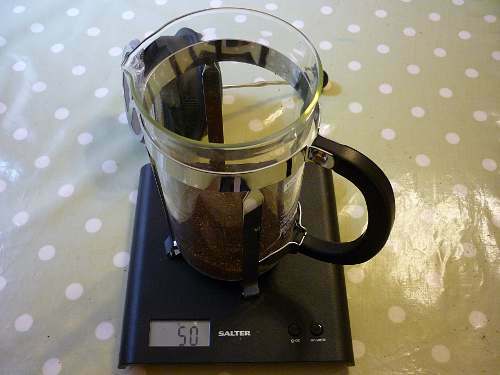 By taring the scales (resetting them to 0) you can accurately weigh the amount of water you use. If you use the same amount of water each time by weight you eliminate changes in the amount of water. This means you can simply alter the amount of coffee and know where you are. You can adjust this time to your tastes. 4 or 5 minutes will do it just fine. Here all you need to do is gently break through the crust floating on the top of the press so that it falls to the bottom of the press. Next using two spoons (soup spoons are ideal for this) scoop the residual foam floatin on the top of the press. 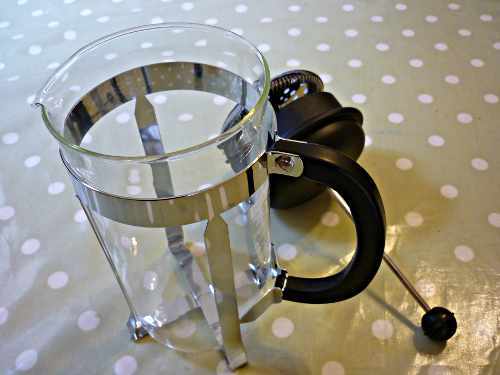 This step helps remove the finest coffee particles so you don’t get a sludge in the bottom of your cup. Having broken through the crust there should be minimal resistance to plunging the press. Do so slowly in any case as attempting to force it can result in hot coffee firing out of the spout. Lastly all that’s left is for you to pour and enjoy your freshly brewed coffee.